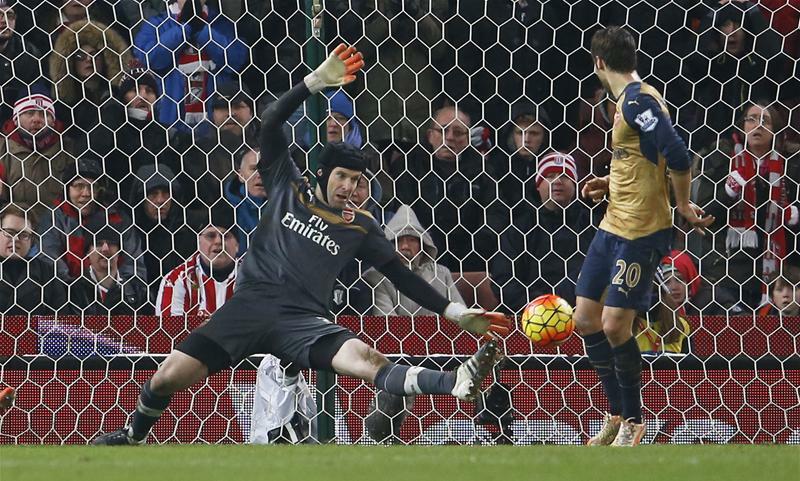 Stoke City 0-0 Arsenal – Cech Saves The Day as Arsenal Prove Mettle. Match Review. New Author 14th January 2018 Arsenal, Exclusive, fans, football, premiership, reviewTagged cech, defence, draw, ozil, Sanchez, stokeLeave a Comment on Stoke City 0-0 Arsenal – Cech Saves The Day as Arsenal Prove Mettle. Match Review. Stoke maintained their excellent record at the Brittania versus Arsenal with this stalemate – the Gunners have now failed to win at Stoke since 2010. Debate raged on all platforms if this should be seen as two points dropped or one gained, but a trip to Anfield and the Brittania within four days and managing to escape without loss can be regarded as a satisfactory job. Before kickoff, the buzz was surrounding Arsenal playmaker Mesut Ozil and a mysterious foot injury. Lo and behold, when the teamsheet was revealed, the mercurial German was absent from both the starting lineup and the bench, and this was to be a pivotal factor in the upcoming ninety minutes. Another point of speculation surrounded the presence of Alexis Sanchez and new signing, Mohamed Elneny. Would Sanchez make the cut and prove his fitness? Would Gooners get a glimpse of their Egyptian newboy? The swift answer was no on both fronts. The Chilean would be saved from a chilly bench and it looks as though he may be being saved for the huge encounter with Chelsea next weekend. Mohamed Elneny was on the bench, and would have been hoping to make his debut, but from the moment the first whistle blew, he would have been under no illusions that this league will be a huge step up from the Swiss league – especially in regards to the physical tests he must face up to. With Mesut Ozil missing from the lineup, Alex Oxlade-Chamberlain was once again given a chance to impress – and this time it was in the coveted Number10 slot. With Aaron Ramsey and Flamini in the centre, with Walcott and Campbell on the flanks and providing support for lone striker Olivier Giroud, Oxlade-Chamberlain would be tasked with unlocking a forceful and well-drilled Potters backline. It was no easy task. The early stages were filled with niggly fouls and the rhythm of the game was virtually non-existent. Referee Craig Pawson had his hand forced with some challenges, but for a few decisions, a well timed advantage played wouldn’t have gone amiss and would have benefitted the first twenty or so minutes. There were chances for both sides, Afellay shooting just wide from twenty yards, but the best chance fell to Olivier Giroud – running through and onto a fine ball from Campbell – but Jack Butland rushed out to save well. The games staccato-like nature continued, but Oxlade-Chamberlain’s shot from just outside the box was dealt with by Butland again. The first half petered out, not through a lack of effort, but there was a distinct lack of cutting edge from both teams. When a cool head was needed to make a pass that would lead to a chance, both sides were lacking. Arsenal, devoid of the vision of Ozil, were applying pressure but the dogged rearguard of Stoke were providing a stern test. Stoke looked a threat when on the front foot, but it was when they broke after being penned in by the Gunners passing play that they posed the greater threat. Nonetheless, the half ended with both teams drawing a blank. The second half began and soon Arsenal had their best chance of the game, and it fell again to Giroud. An Aaron Ramsey corner which came from good pressure from Chamberlain was met by a firm header by Giroud. 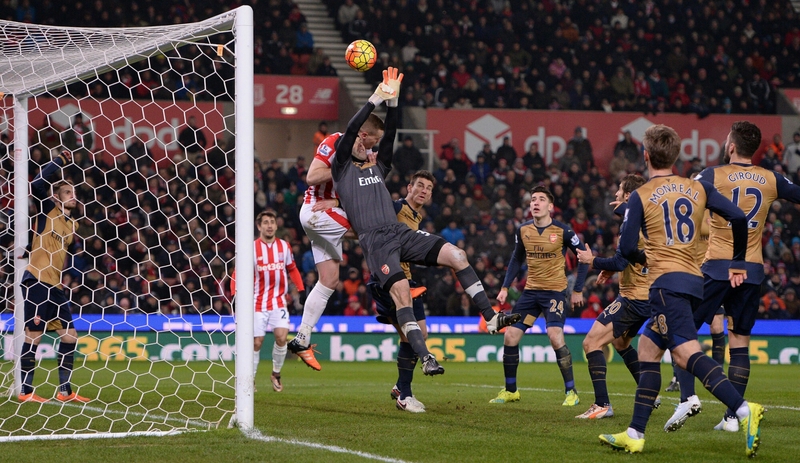 Jack Butland at full stretch provided a great save to keep parity in the scoreline and Giroud was denied again. There was then a question of whether Theo Walcott had earned a penalty. Racing onto a pass from Nacho Monreal, he looked to have been pulled back by Philip Wollscheid. The incident did begin just outside the box, but it was a moot point as Craig Pawson adjudged the challenge to be fair. Stoke may have felt left out as Arsenal tested Butland’s credentials, and thus began the last half hour of proceedings, in which Petr Cech really earned his corn. Marko Arnautovic played in Joselu, who sidestepped Laurent Koscielny with ease before lashing in a shot to Cech’s left. The Czech stopper pushed the ball out but it was an onrushing Bojan who met the rebound. Once again, Cech was the efforts equal, getting up quickly to shut off the angle and nullify the shot. Joselu then tested Cech again with a twenty-yarder after cutting in, which Arsenal’s keeper saved well from but gave away a corner. It was from this corner that Stoke had their own penalty appeal – the ball hitting an unsighted Joel Campbell on the arm. It was completely accidental but both teams now had a penalty shout turned down and chances spurned. This match could have went either way. At this time, Theo Walcott was replaced by the impressive Alex Iwobi and Arsenal had another chance, with Joel Campbell taking the selfish option and trying to curl it in rather than find a teammate. It could have been costly, as Stoke came closer to breaking the deadlock than any previous effort. A corner was whizzed in and a near-post flick on was heading in until Aaron Ramsey on the line headed away. Sighs of relief from the Arsenal away fans – who deserve a mention after singing vociferously throughout and giving the boys on the pitch a needed lift. The home fans however, revelled in some vile behaviour with songs directed towards Aaron Ramsey and Arsene Wenger. The game finished and both managers could put forward reasons why they should have won, but a draw was perhaps the fairest result. If the walking wounded who are due to return next weekend were to have played in this match, then the three points could have been heading to The Emirates. If Alex Oxlade-Chamberlain could perhaps glean some of the composure shown by his more illustrious teammates and make better decisions, then who knows? The Ox flashed a few moments of skill and showed what potential lies beneath, but it is approaching a time when he must gain some consistency. These opportunities to start games are fleeting, and with players returning, he could well find himself as a regular substitute if he doesn’t hit a vein of form soon. If Chamberlain is searching for good form, then Petr Cech has so much he could donate some to his teammate. It was his display that kept Arsenal in the game – especially in the later stages and that claim before the season started that his acquisition could be worth an extra ten points is looking accurate. He was so reassuring and he was vital in enabling his side to regain top spot. The Gunners returned to the top, even though with this draw they have only won one away game in the last six and have dropped four points in the last two games. It speaks volumes that Arsenal still sit on the summit even with these slips. Another against Chelsea next week is simply not acceptable for prospective champions. Arsenal – A New Religion?